SailBlogs.com is a free blog (sometimes called a weblog or an on-line diary) hosting service, tracking system and social network that has been developed with the needs of remote travelers in mind. What that means is that we have created all the necessary tools to enable you as a member to post your writing, current position and photos to your account page from anywhere in the world, without having to do any programming yourself. There is no HTML required, are no links between this server and a secondary server to establish, no messy file transfers, no need, really, to have another site at all (unless you want one). We have built enough customization into SailBlogs.com to allow you to make a truly unique Weblog that fits with your style and adventure, and made it very easy to get started and establish a Web presence. Click here for more information about Premium and Pro. SailBlogs.com first and foremost has been designed to be simple to use. A journal can be established and configured in just a few minutes, with posts only taking a few clicks to add. 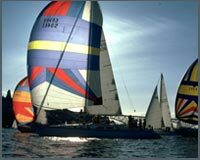 SailBlogs.com provides the ability to include a table of contents, will order your posts by date and time, and can have multiple entries per day and per page and a host of other customizations. In addition, we have designed SailBlogs.com to be modular, with the ability to easily add new features when you need them. In order to provide this service, we require that each blog display an unobtrusive block of advertising that has been designed for the template you've chosen. The ads are provided by Google, and as such will be related to the content of your blog posts. This ensures relevant advertising for your visitors and allows us the ability to give you a cost free membership. These ads can be removed, or used by members for their own purposes, if an advanced SailBlogs membership is purchased. PLEASE NOTE: SailBlogs is NOT a classified advertising or personal ad system. If you set up a blog with this type of post, it simply will not be effective. There are other systems and message boards designed for this purpose. SailBlogs does not promote your blog - that is the member's responsibility. Some advertising might also violate our terms & conditions and those accounts could be suspended.